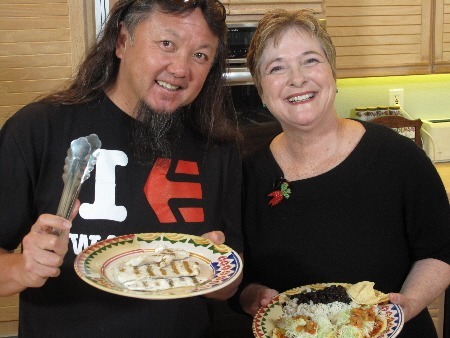 Cathy’s article was on Wing Lam sharing his famous recipe for the signature fish taco. There is also a short companion video with Wing showing the cooking process. You’ll find the video on her website. Cathy then continued her comments on Melissa’s 50 Best Plants On The Planet with her notes on Chrysanthemum Leaf. The recipe for Thai-Style Carrot Soup with Chrysanthemum Leaves is posted on our Website in the “Recipe” File. Kale, a current darling of chefs, was next on the menu. Kale salad seems to have popularized the current trend. The book includes a wonderful recipe for Kale Salad with Dates and Almonds. Cathy concluded the conversation explaining the recipe for Kale and Cannellini Beans with Crumbled Sausage enjoyed by her daughter. This is a handy book for reference that’s a must for any home cook.